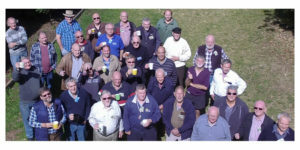 Parramatta District Men’s Shed Inc is a non-profit organisation setup as part of the Men’s Shed movement – a movement to gain awareness of men’s health issues, and to provide a place for men to meet with other men. The Parramatta District shed provides a place for men (any age from 18 +) to meet, and a place for men without a shed to tinker with tools with our vast array of gardening, metal and wood-working tools and machinery. In the Parramatta District Men’s Shed, you may see men making new things, fixing old things, or sharing their skills and knowledge with others. But most importantly, you’ll find an atmosphere of old-fashioned mateship among the members. The shed is a very relaxed environment… a place for men to come and relax, chat with others and share a cuppa. If you’re interested in learning more about the Parramatta District Men’s Shed, have a look at the about page, or read some of the latest news. You can also have a look at some of the projects the men of our shed have been getting up to. As well as this, you could have a read through some of the tutorials the men of the shed have shared. If you’re then interested in having a look around our shed, or signing up as a member, get in contact with us. We’d love to hear from you!